Reviews flowing in from the Netherlands Appstore. Got some nice reviews in the Netherlands App Store. If you like the game, I would really like it if you give it a review in your AppStore. 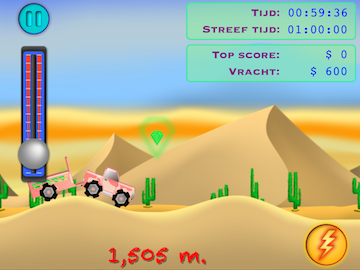 Also did you try the new jeeps and levels in the Extra Edition? Permalink | Reacties uitgeschakeld voor Reviews flowing in from the Netherlands Appstore. Permalink | Reacties uitgeschakeld voor Update is now available! Permalink | Reacties uitgeschakeld voor The BOOST BUTTON tip! Permalink | Reacties uitgeschakeld voor New update coming soon! – Drive carefully, you don’t need to rush it. – Learn the tracks and the different obstacles, some you need to take slow, some you can drive over really fast. 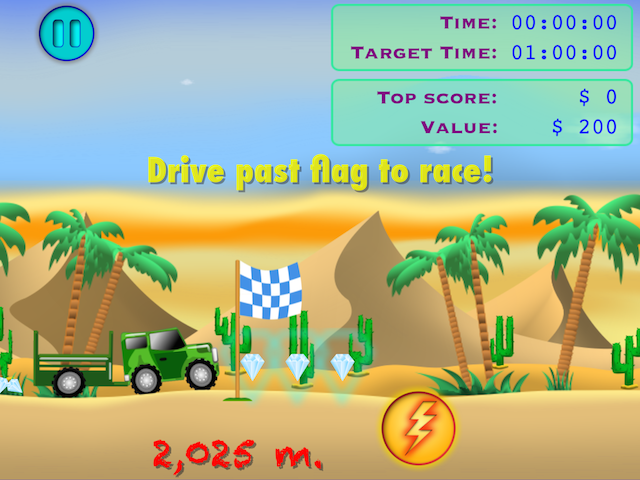 Bumpy wheels is now available for free for iPad and iPhone. https://itunes.apple.com/us/app/bumpy-wheels/id840319292 . (Extras download will be available soon). Release in a couple of days!!! Permalink | Reacties uitgeschakeld voor Release in a couple of days!!! Like every development project “Bumpy Wheels” will also have som delay. Still, progress is going strong and to prove it, hereby another screenshot. This is one from the full version with the ‘desert’ level.